Photo by Kevin Smith A beach feast for any time of year. Ceviche (pronounced seh-vee-chay), is a dish that can be found along the Latin American coast from Mexico to Peru. 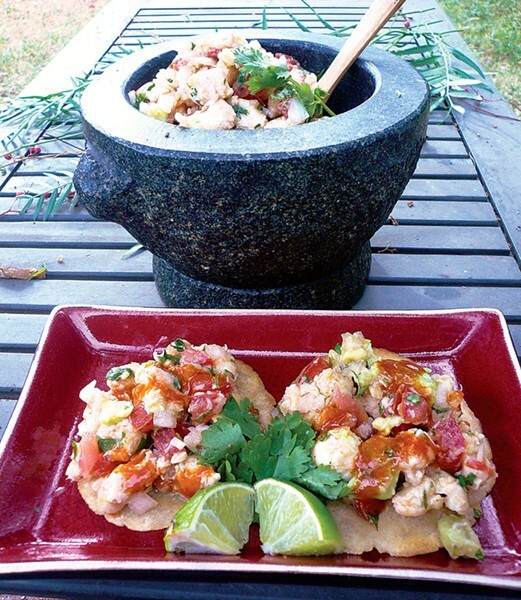 Regional variations in the ratios and types of ingredients included in a "proper ceviche" translate to slight differences in taste and texture depending on the country you visit. Two ingredients that are always key to a good batch of ceviche are citrus juice (typically lemon or lime) and fish. Traditionally the fish is cubed and submerged in a bowl of lime juice overnight. The citric acid cooks the fish, transforming it from a raw state to white and flakey in a matter of 12 hours. I fell in love with ceviche on a free-dive/spearfishing trip to Cozumel, Mexico back in 2006. When my brother and I returned to classes at Humboldt State University, we were on student budgets, but we were raised on hunting, fishing and foraging. 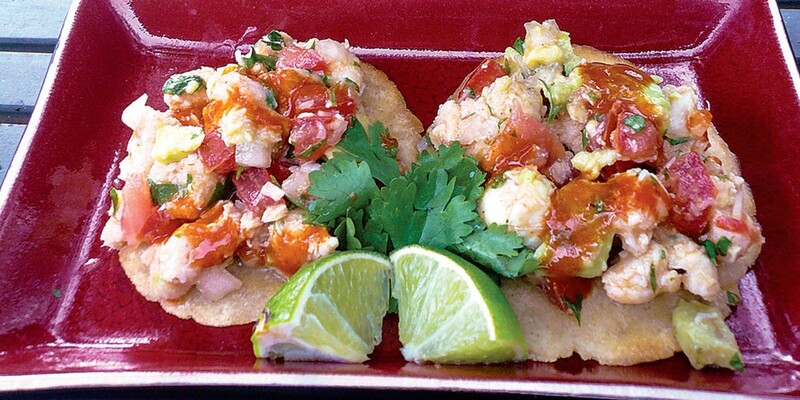 So one day, after a successful free-dive on the North Coast, Justin and I decided to use some of our fresh-caught lingcod to recreate ceviche tostadas. But we wanted ceviche right away. We added a simple step to the ceviche process — blanching — that cut down production time to a mere 30 minutes. The process is simple, and the recipe works great with any number of white-meat ocean fish including lingcod, rockfish, greenling or even surfperch. Make sure you start with boneless fillets. If you are not catching the fish yourself, try to buy directly from the docks at Trinidad or from a local grocer who stocks wild, line-caught, locally harvested, sustainable ocean fish. This recipe is always well received by fish lovers. The flavors in it are by no means subtle — the bold lime, cilantro, onion and chili make for vibrant tastes. If you are pressed for time, you can simply buy pre-made corn tortillas and fry them. You can also just eat the ceviche with a bag of corn chips. But if you have an extra 15 minutes, making fresh corn tortilla tostadas from scratch will make the overall dish even tastier. Cut the fillets into ½-inch cubes and blanch them in boiling water for 3 minutes. This ensures that the fish is fully cooked before beginning the rest of the process (which means you do not need to let it marinate overnight). Watch the fish so it doesn't boil over. Drain the water and cool the cooked fish on a plate. Cut the tomato, cilantro, onion and chili pepper as you would for salsa and set them aside. Once the fish has cooled, move it to a bowl and squeeze the juice of two limes over it, mixing until it's thoroughly coated. Now make the tostadas. Knead the masa and water together and let it rest covered for 15 minutes before rolling it into about 10 balls, adding a little water to soften if necessary. If you have a tortilla press, now is the time to use it. If you're looking for one, I always seem to find them at thrift stores, though they can usually be found under $15 new. If you're a poor graduate student like me, just use wax paper and one of your (clean) textbooks. Press out thin, small tortillas about 3 inches in diameter. Cook them in a dry cast iron skillet over medium heat for about 1 minute per side. Once seared, transfer the tortillas to a second skillet and fry them in oil until both sides are golden brown. Let them dry on a paper towel. Now back to the ceviche. Press the old lime juice out of the fish with a fork and dump it. Add fresh juice of one lime to the fish (which it will readily absorb). Add all of the fresh ingredients except the avocado and mix them up. Now add the cumin, salt, chili powder, finely diced jalapeño and Tapatio to taste, and mix again. Finally, chop the avocado into ¼-inch cubes and add it to the ceviche giving it a gentle mix to distribute the ingredients. It's important to wait until the end to add the avocado as you do not want it to mash up and leave your ceviche looking like strange, fishy guacamole. This is also why you want to avoid overly soft avocados. Now heap a few tablespoons of ceviche on each tostada and serve quickly while the tortillas are warm and still retain their crunch.